Play Theory: This depends on the defense. Against a Cover 3, Green will be open on the out (3 route). Against a Cover 2, then either Red or Blue will be open. The theory behind this play is to eventually put the safety in a choice situation where either Red or Blue will be open. If the defense continues to play a Cover 2, then offense can work up the field, hitting Green for good chunks of yards. Using the Passing Tree naming convention, this play would be called, “Trips Left – 983”. Quarterback Tip: To determine what the defense is playing, the quarterback should key on the cornerback on the play side. If the cornerback stays in the area waiting for Green, then the defense is in a Cover 2. If on the snap, the cornerback immediately drops to cover Red, then a Cover 3 should be assumed. If the quarterback has time against the Cover 2, a pump fake could lead to a big play. The safety will be responsible for both Red and Blue as both will be in his zone. A pump fake to Blue should draw the safety in allowing the deep pass to Red to be open. 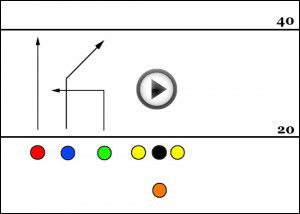 For other free flag football plays, visit the Free Plays section. You can subscribe to this site on the right side and receive new plays in your email or RSS reader.